BHP Billiton announced this week that CEO Marius Kloppers will step down in May and will be succeeded by Andrew Mackenzie, the current head of the company’s non-ferrous division, who worked for BP for 22 years and who worked for Rio Tinto prior to joining BHP Billiton. Benchmark iron ore prices rose to a 16-month high at approx. $160/t this week. A cyclone is nearing the Australian coast, potentially causing supply disruptions in the coming week. BHPB’s appointment of a chief executive with extensive experience in the oil and gas business signals a further shift of focus from mining to natural resource extraction in general. Given the importance of cost control in the coming years, and considering the company’s asset base in oil and gas and the limited understanding of the oil and gas industry by most miners, appointing an insider with good knowledge of the full range of assets is a logical choice. 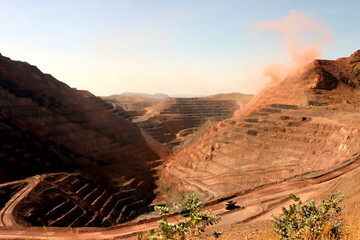 The increase of iron ore prices is expected to be a relatively short-term development driven by weather expectations and the annual cyclical demand of Chinese importers. which peaks in Q4 and Q1. Long-term price expectations are still much below the current level as additional production capacity is being added at a high pace. Lonmin announced a $800m rights offering, in that way fending of the proposal by Xstrata to increase its stake in the troubled platinum miner to a majority share. The strikes in South Africa, which escalated at Lonmin’s operations, have caused significant lost production and urgent financial issues for Lonmin. BHP Billiton has started the search for the successor of CEO Marius Kloppers. Apparently the company will not necessarily promote an insider to the top position. With Mick Davis leaving Xstrata if/when the merger with Glencore is approved and Cynthia Carroll leaving AngloAmerican next year, 3 of the top CEOs in the mining industry will change. Iron ore exports from the Indian state of Orissa will be limited strongly by new production quota for mines without processing facilities. The government is trying to attract processing investment to prevent iron ore is only exported without significant benefit for the country. High export duties (raised to 30% early this year) and production quota are used to discourage exports from the world’s 3rd largest iron ore exporter. Orissa’s attempts to curb exports don’t do much to stimulate local investment in processing capacity. India’s government announced a year ago that it would make it more attractive for companies to invest by setting up mining right and process plant permitting packages. With the current uncertainty about both global demand and India’s local demand outlook it is unlikely that large investments in additional processing capacity will be made in Orissa in the near future. As a result the will mainly slow down the local economy. Almost a year ago, after the announcement of Ferreira as new CEO of Vale, this blog conducted a poll among its readers to find out which top company CEO was mostly to be replaced first. The results showed most trust in the future of Kloppers at BHP. A year later 3 out of 4 are on their way out, while most CFOs have been replaced over the past 2 years too. The high level of activity in replacing top executives indicates a change of mindset in the boards of these companies: shifting from a focus on growth and investment to a focus on operational excellence and payout. The new group of top executives will mainly need to show a track record of cost-control and willingness to make tough decisions on closure of mines. “BHP Billiton Ltd. said Thursday it plans to acquire Petrohawk Energy Corp. for more than $12 billion in cash, giving the Anglo-Australian mining company access to large shale assets in Texas and Louisiana in one of the largest deals of the year. BHP will pay $38.75 per share, a 65% premium to Petrohawk’s closing price on Thursday of $23.49 a share. Key synergies targeted in the deal are in financing new projects: Petrohawk has the reserves, and BHP brings the funds to develop them. The premium of 65% reflects this increased investment, as it values the company on 7.5x PE rather than 4-5x PE. Last February BHP bought a set of shale gas assets from Chesapeake Energy for close to $5bln. In a poll on this blog in February 57% of respondents thought BHP should expand further in the oil & gas arena. The $12bln tender offer is all-cash, largely solving BHP’s ‘problem’ of a huge cash pile that some people rather had seen returned to shareholders. With current high iron ore prices the company is generating cash much faster than it is able to invest in organic growth. The acquisition increases the weight of the petroleum business in BHP’s portfolio and makes BHP enter in the top 10 of largest petroleum companies in the USA. This development follows the entry of various large petroleum companies in the mining area through oil sand projects. Still it is unclear if more miners will position themselves as ‘large scale commodity producers’ active in both mining and petroleum businesses. “BHP’s cash pile – which in June last year stood at $12.5bn (£7.8bn) – may explain investors’ indifferent reaction to the failure of its $39bn hostile bid for PotashCorp last November, as well as two previous failed deals. BHP’s progressive dividend policy suggests that last year’s $4.6bn dividend payments will be exceeded this year, starting with the interim pay-out. Share buy-backs may compensate investors for BHP’s failure to complete the Potash deal or an iron ore tie-up with Rio Tinto. The company said on November 15 that it would buy back $4.2bn in shares. That sum, however, is intended to complete an existing $13bn programme announced in 2006. This opens the way for a new buy-back to be announced as soon as the interim results. Keep the cash; wait and see what happens. Major acquisitions in the current field of operations of BHP Billiton will be pretty much impossible because of regulatory issues. The only areas in which acquisitions larger than $5bln might be successful is in precious metals/diamonds/uranium or oil&gas. Many investors won’t be happy with the latter, as it is hard to prove any synergy between operating a mining company and operating an oil&gas company. One of the most important topics for the company where the abundance of cash might be helpful is in establishing a stronger presence in China. The Chinese government is opening up the country for investment to enable access to the more challenging reserves. Partnering with a Chinese firm and actually starting operations in China would create a lot of goodwill for the BHP management with the Chinese rulers.